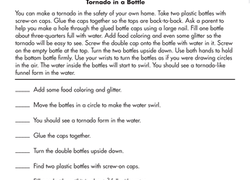 Help your third grader practice following directions on how to build a tornado in a bottle, and build his reading comprehension skills in the process. Use this resource with your students to practice one of the core reading strategies: determining importance. Read this fable and answer questions to practice reading comprehension. After your students finish reading this story about Leo and how he overcomes his soccer injury, they will answer who, what, when, where, why, and how questions about the text. Your third graders will love reading this story about Mike, his friends, the kickball game, and the runaway ball! Make reading fun with this whale of a tale, "How the Whale Got His Throat," by Rudyard Kipling!